With Fall in the air, my tastebuds long for Italian sausage sandwiches. I grew up partly in the Upstate region of New York, home to lots of immigrants from Italy. Sausages grilled with sweet peppers and onions are the food of Fall football games and neighborhood festivals – even if, like me, you aren’t Italian. “Where you from?” I ask, trying to sound casual. “Grew up in Rochester,” says Richard McCoy, hands a blur at the gas grill. “Cooperstown,” pipes up a customer. “Skaneateles,” chuckles another. Oh yes, I’m in the right place! But will the sausage be right? McCoy arrived in 1993 for school at UNC Charlotte and hooked up with another Rochester expatriate, K.T. Connors, who ran hotdog carts. 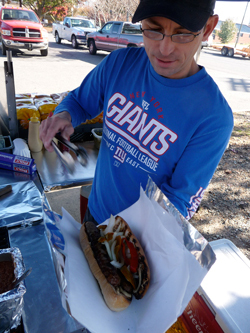 “Back when I started, customers in Charlotte had never heard of Italian sausage,” recalls K.T. Now the pair has a loyal following, not just former Upstate New Yorkers, but also contractors who like a hearty quick lunch when they stop at Little Hardware for supplies. And on Panther game days, look for the KT’s NEW YORK cart on Morehead Street at Church Street. “We’re trying out Zweigle’s white hots – white hotdogs made of pork and veal,” tempts McCoy.